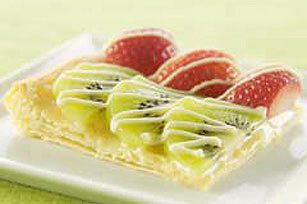 Top this fruit tart with strawberries, kiwis and a white chocolate drizzle. This White Chocolate Fruit Tart features a fluffy baked puff pastry crust. Preheat oven to 400°F. Thaw pastry sheet at room temperature 30 min. Unfold pastry on lightly floured surface. Roll into 14x10-inch rectangle. Place on large ungreased baking sheet. Brush edges of pastry with water. Fold over 1/2 inch edge of pastry on all sides to form rim; press firmly to secure. Pierce pastry with fork. Bake 15 min. or until golden brown. (After 10 min., gently break any large air bubbles in pastry with fork.) Cool on wire rack. Microwave 5 oz. white chocolate and the half-and-half in large microwaveable bowl on HIGH 2 min. or until white chocolate is almost melted; stir until chocolate is completely melted. Spread onto pastry; top with fruit. Melt remaining chocolate as directed on pkg. ; drizzle over dessert. Refrigerate 1 hour or until ready to serve. Cut into 12 rectangles. Store leftover tart in refrigerator. Substitute any seasonal fruit, except bananas, for the kiwi and strawberries. Pat kiwi slices and strawberry halves dry. Dip each piece halfway into 6 oz. melted BAKER'S Semi-Sweet Baking Chocolate; let excess chocolate drip off. Refrigerate on wax paper-covered baking sheet 30 min. or until chocolate is firm. Prepare tart as directed, substituting the chocolate-dipped fruit for the plain fruit.